Four brightly colored calligraphic prints from the “Poem” series (1970/71) by Japanese artist Haku Maki (1924–2000) were examined using multiple light-based analytical techniques in an effort to address conservation concerns regarding these artworks. A distracting white haze on the surface of some of the prints was determined by light microscopy and infrared microanalysis to be fungal mycelium from an inactive mold infestation that occurred prior to the artwork’s acquisition by the museum. Pigment analysis by Raman, X-ray fluorescence, and infrared microspectroscopies identified the artist’s palette as containing common printing ink colors such as aniline black (PBk1), carbon black (PBk7), phthalocyanine blue (PB15), Prussian blue (PB27), ultramarine blue (PB29), molybdate orange (PR104), chrome yellow (PY34), barium yellow (PY31), viridian (PG17), barium sulphate (PW21), and synthetic organic red pigments (PR3, PR22, PR48:3). Although aniline black and molybdate orange are common industrial pigments, reference vibrational spectra to assist in their identification have not appeared previously in the conservation literature. Moreover, this investigation includes to the authors’ knowledge the first published identification of these pigments in a work of fine art. Haku Maki’s unique ‘cement-on-woodblock’ printing technique in combination with his vibrant palette creates dynamic, embossed effects in these prints. However, lightfastness testing using a microfade tester identified the potential for light-based damage to the artwork, in some instances showing poorer lightfastness for colors reported to be stable pigments and greater stability than anticipated for others. These analyses are the first objective study of this innovative artist’s material choices, and they enhance our understanding of his printing technique while helping to determine the proper stewardship protocols to protect his artistic legacy. Maejima Tadaaki (1924–2000), known since 1950 as Haku Maki, established himself in the canon of Japanese printmakers by producing prints of modified Chinese characters (kanji) in brilliant, contrasting colors using an unusual embossing technique . A small collection of his prints was gifted to the Indianapolis Museum of Art (IMA) in 2013, and four of his works from the “Poem” series (Fig. 1) were recently investigated to understand their state of preservation and to learn more about the materials of this innovative artist. This research considers issues of light in both appreciating and protecting these brightly colored artworks, while also demonstrating the application of light-based technologies for the analysis of art. These “Poem” prints are part of a distinctive artistic group of works created in the late 1960s to early 1970s, a period when Maki’s key work, Festive Wine, was receiving international recognition . The series bears the striking contrast of colors, dramatic embossing, and innovative textural effects that are hallmarks of Maki’s prints, bringing his ancient subject matter into a modern print vernacular. These visual properties were created using a printmaking technique that involved building up cement around the carved designs on a traditionally prepared woodblock . The technique used for creating the “Poem” series was slightly modified from his other kanji prints. Laminated sheets of damp paper were laid over the uninked, cement-enhanced woodblock and passed through the press a number of times to deeply emboss the figural elements and to impart the cement’s texture. Velvety black poster color was then applied to the entire surface of the paper with the exception of the margins. Laying a stencil over the matte black areas, Haku Maki applied colored inks over embossed areas. In the scant contemporary literature on Maki’s printmaking [1, 2], he is reported to have relied on Portland cement modified with a chemical bond additive to create his hard textural surfaces and a coating of shellac to prevent water penetration into the block. His colors were comprised of poster paints, oil paints thinned with turpentine, and full-bodied offset printing inks diluted with a thinner spread ink to prevent the paper from sticking to the block or to create a glossier appearance. Other than this meagre description, little definitive information is known about his choices of pigments or media. Of the 24 prints donated to the museum in 2013, a few were observed at the time of their accessioning into the collection to have patches of white efflorescence on their surface, most easily seen in the velvety black regions (see Fig. 1a). These prints had been previously framed under glass, and it was thought that the white haze might be a fatty acid bloom arising from the printing ink’s interaction with the storage environment [3, 4]. Although an investigation of the artworks’ condition instigated the study of the prints discussed here, it was also desirable to learn more about Maki’s choice of printing inks and paints as well as to assess the stability of these intensely luminous colorants to light prior to their exhibition. Pigment reference samples were acquired in order to confirm spectral characterizations and to construct model samples of paint mixtures. Aniline black (Paliotol L0080, PBk1) was acquired from BASF, chrome yellow medium (PY34) and toluidine red (PR3) from Kremer Pigments, and molybdate orange (PR104) from Rublev. A reference for lamp black (PBk7) was acquired in the form of a commercial Winsor & Newton watercolor tube paint. Model paints were prepared by mulling the pure pigment or pigment mixtures with Kremer gum arabic prepared as a thick watercolour paste according to an artist’s recipe  and spread to dry on white paper or glass slides. Stereomicroscopy was performed at low magnification (7.5× to 150×) on a Zeiss Discovery V20 microscope while inspection at higher magnification was performed in transmission mode on a Zeiss AxioImager M2m compound microscope. Microsamples of the white haze were acquired for transmission optical microscopy using a tungsten needle and then transferring the sample to transparent adhesive tape that was adhered to a glass microscope slide. Photomicrographs were taken using a Zeiss ERc5 digital camera on the stereomicroscope and a Zeiss MRc5 on the compound microscope. Fourier transform infrared (FTIR) microspectroscopy was performed on a Continuum microscope with an MCT A detector coupled to a Nicolet 6700 spectrometer purged with dry, CO2-free air. The spectra are the sum of 64 coadditions at 4 cm−1 spectral resolution. Microsamples were crushed on a diamond compression cell and held on a single diamond window during the analysis. Sample identification was performed using the Infrared and Raman Users Group (IRUG) reference spectral library. Raman spectra were acquired using a Bruker Senterra microspectrometer on a Z-axis gantry. The spectrometer utilizes 3 selectable excitation lasers (532, 633, and 785 nm), an Andor Peltier-cooled CCD detector, and a 50 μm confocal pinhole. Laser power at the surface of the print was below 5 mW. The spectra are the result of 10 s integrations with 10–30 coadditions. A 50× ultra-long working distance objective was used to focus on select pigment particles directly on the prints. The analysis spot size was on the order of 1 μm, and the spectral resolution was in the range of 3–5 or 9–18 cm−1. OPUS software allowed for automated cosmic spike removal, peak shape correction, and spectral calibration. A Bruker Artax microfocus XRF with rhodium tube, silicon-drift detector, and polycapillary focusing lens (~100 μm spot) was used in the analysis. Experimental parameters included 50 keV tube voltage, 600 μA current, and 600 s live time acquisitions. A helium purge gas allowed for light element detection. Elemental survey spectra were collected in the energy range from 0 to 50 keV. In situ accelerated lightfastness testing was achieved with a Newport-Oriel style microfadeometer previously described by Whitmore et al. . The xenon arc lamp source was filtered to emit only visible light in the wavelength range of 400–700 nm. The luminous flux was measured at ~0.72 lumens using an ILT1700 radiometer with SPD024Y probe from International Light Technologies. Spectral reflectance data were acquired from an approximately 400 μm spot every 30 s over the period of 10 min. Color difference was calculated using the CIE Lab* color difference equation from 1976. Fading data were analysed and plotted using GCI Spectral Viewer™ software. Triplicate analyses of fading curves for ISO Blue Wool Standards 1, 2, and 3 (BWS1–3) from Talas were collected prior to the analysis of the artwork. Single in situ measurements were made of each prominent color observed in the print under study. A lightfastness equivalency for each paint or ink was assigned based on the sample’s similarity to fading curves for BWS1–3. Optical stereomicroscopy was used to examine the white hazy patches that appear most clearly in the black sections of the prints. Figure 2a shows a magnified image of the offending material from Poem 71–29 (Fig. 1a). The white film was observed to be a soft, fibrous network of filaments in this area and a thinner hazy sheen in other prints. Removing these particles as a microsample without disrupting the black ink layer was difficult, indicating that they had penetrated into the ink. Probing the black surface with a needle revealed the ink to be very fragile, suggesting that a highly underbound paint was used to produce the velvety black surface. A thicker agglomerate of white filaments, shown in b, allowed the lifting of a microsample of the white material without losses to the underlying black paint. These threadlike white samples were further analysed by imaging and spectroscopic techniques. Examined in transmission mode using a compound microscope, the sample in Fig. 2c shows that the white filaments appear similar to dehydrated fungal hyphae, suggestive of biological growth, however no characteristic conidia were observed. 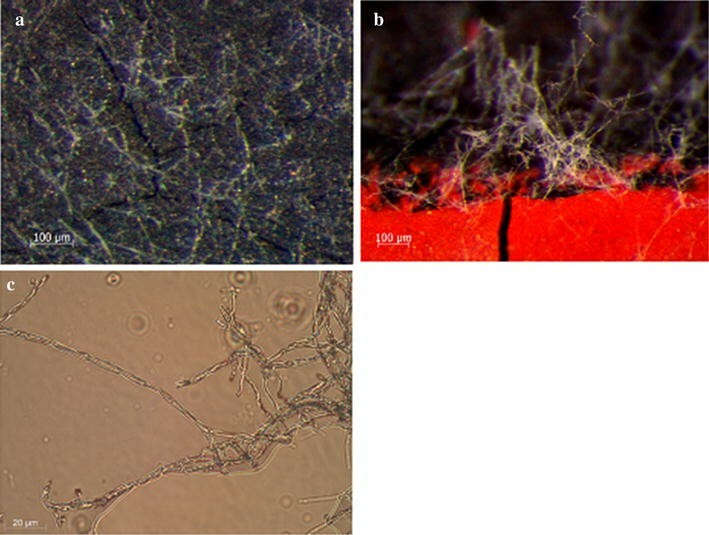 To confirm the biological nature of the white surface material, an infrared spectrum of the filaments was obtained (Fig. 3a). The spectral features did not appear similar to cotton fibres from the paper (Fig. 3b), ruling out a disruption of the printing support that could have resulted from the repeated pressing typical of Maki’s technique. The spectrum of the white filaments reveals glycoprotein bands comparable to previous studies reported for fungal mycelia [7–9]. The bands at 1643, 1545, 1452 cm−1 were attributed to protein amide I, II and III. It should be noted that Maki has not been reported to use any proteinaceous glue based sizing or adhesive for laminating—only rice starch paste —so contamination is unlikely. The shoulder at around 1720 cm−1 can be attributed to lipid C=O stretching, and the remaining C–O and C–H vibrations between 1420–1030 cm−1 can arise from cell carbohydrate and phospholipid moieties. The assignment of the spectrum to mold was further confirmed by its close comparison to a white mold sample obtained from decaying vegetable skins (not shown). Although the nature of the disfiguring white haze was quickly resolved using light microscopy and infrared spectroscopy, the nature of the pigments, especially the matte black pigment on which the mycelia were concentrated, was also of interest. Only a single contemporary description of Maki’s printing technique exists, and with the exception of cobalt blue , no specific pigments are given for his brightly colored inks. To preserve the original artwork, every effort was made to conduct only non-destructive, in situ analyses of the artist’s palette. However, when sampling or attempting to sample the white filaments from the prints, microsamples of the underbound black matte paint were also dislodged and became available for invasive analysis by transmission FTIR spectroscopy. As seen in Fig. 4, the FTIR spectrum of (a) the black paint from Poem 71–29 matches that of (b) a reference sample of aniline black pigment (PBk1). The structure of this synthetic organic black pigment is shown in the inset of Fig. 4. Its strong visible absorption arises from its highly conjugated polymeric structure. The strong bands at 1590 and 1508 cm−1 in the FTIR spectrum are attributed to quinonoid and benzene ring stretching whereas the sharp features at 829, 754 and 696 cm−1 arise from the di- and mono-substitutions of the benzene rings . Although a clear indication of the black pigment was obtained, no evidence of the binding medium was seen in the FTIR spectrum, again hinting at a largely underbound matte black paint used on the prints. Aniline black, also known as chrome black, is perhaps the earliest of the synthetic organic pigments, being discovered between 1860 and 1863 . It is known for its matte finish , which Maki uses to contrast with the glossier, high key pigments of the colored subjects. Although aniline black is known to have been widely used in the printing and dyeing industries since 1863, it has only before been specifically identified in the cultural heritage literature as an ink in a 1930s printed book . In that work, Doncea and Ion published a diffuse reflectance infrared spectrum (DRIFTS) for the pigment, but the dependence of the DRIFTS technique on the optical properties of the sample make it insufficient to serve as a general reference for further identifications. It should be noted that the popular Infrared and Raman Users Group (IRUG) spectral database does not contain a reference spectrum of aniline black , which may have contributed to the lack of observed occurrences for this historically important pigment. To the authors’ knowledge, the aniline black reported here for three of Haku Maki’s “Poem” series prints is the pigment’s first discovery on a work of fine art. The use of aniline black has declined since the mid-1930s when other synthetic blacks that were safer and easier to apply emerged onto the market . It is worth noting, however, that the pigment is still included in several commercial artists’ paint lines, such as Winsor & Newton’s Designers Gouache Jet Black (#50947171) and Holbein’s Artists’ Watercolor Tube Peach Black (#W137 W337), where it is mixed in the latter with lamp black. As such, it would not be surprising to find other examples of the use of aniline black, even in contemporary artworks. The remainder of the inks were analysed non-destructively on the four prints using Raman microspectroscopy and XRF. These results are summarized in Table 1. By casual observation of Maki’s prints, it might seem that Haku Maki used a fairly simple and consistent range of pigments for the “Poem” series, but these results prove otherwise with a rather large range of pigments identified, including for instance three different pigment mixtures for green colors in Poem 71–61. Interestingly, the only pigment previously reported to have been used by the artist, cobalt blue , in fact does not appear in these works. The only vibrant blue in this study that fits that description appears in Poem 70–90 (Fig. 1b) where the paint is in fact comprised of phthalocyanine blue (PB15) with a small amount of Prussian blue (PB27) and ultramarine (PB29). It could be that the previous reference to “cobalt blue” was merely describing a deep vibrant blue colored paint and not the actual pigment. Molybdate orange, PR22, CaCO3, PR48:3? Molybdate orange, PR48:3, iron oxide? The previous identification of aniline black by FTIR spectroscopy in the background of Poem 71–29 was confirmed using Raman spectroscopy on three of the artworks analysed. The 532 nm excitation laser was preferred over 633 and 785 nm for its stronger scattering efficiency, while a very low power of less than 0.1 mW was necessary to avoid thermal degradation of the black pigment. Figure 5a shows the Raman spectrum of the black background in Poem 70–70 compared to a reference sample of aniline black, Fig. 5b, collected as a watercolor preparation under identical instrumental parameters. The bands arising from the black background, namely at 1634, 1596, 1561 (vs), 1403 (s), 1351 (s), 1243, 1185, 810 s, 606 (s) and 415 cm−1, gave a close match to the aniline black reference. However, aniline black can be admixed with a carbonaceous black pigment in commercial paint preparations (vide infra). Unfortunately, the broad Raman peaks for carbon black at ~1325 and 1580 cm−1 fall under the similarly broad features in the pure aniline black reference pigment. Figure 5c shows a reference mixture of aniline black and lamp black in a 4:1 ratio prepared as a watercolor paint. Based on the similarity of the three spectra, it is possible that the poster paint used in the Haku Maki background could be a mixture of both aniline black and carbon-based black pigments. The occurrence of Cr, Cu, S and Cl in the elemental spectrum of these black areas in Poem 70–70, Poem 70–90, and Poem 71–29 (Table 1) is characteristic of aniline black and is consistent with the manufacture of the pigment . The black paint underlying the other colored areas contributes a strong chromium XRF signal to other colors even if chrome yellow is not present in them. Interestingly, the black background in Poem 71–61, made a year later than the other three prints, is characterized as a mixture of carbonaceous black and Prussian blue (PB27). The black background in this print appears visually less intense when compared with the other three prints. The identification of Prussian blue in these blacks has important conservation implications for future treatment strategies; for instance strong alkaline treatments and anoxic environments would not be desirable. Another striking color, the orange in Poem 71–29, proved similarly interesting. As seen in Fig. 6a, the Raman spectrum of the orange paint showed only strong bands similar to those of yellow lead chromate (Fig. 6b) and no other bands indicative of a red or orange pigment contributing to the orange hue observed in the print. A Raman spectrum of chrome orange (PO21, PbO·PbCrO4) is shown in Fig. 6c to rule out the presence of this orange variant of chrome yellow. A tiny sample was extracted and analysed by FTIR microspectroscopy (not shown) to test for the presence of any red or orange synthetic organic pigment. However, only strong chromate stretching bands and bands due to an oil medium were observed, with no features suggestive of a synthetic organic pigment. XRF analysis was undertaken to check for the possible presence of an inorganic component that was not observed with Raman analysis. The XRF analysis of the orange paint indicated the unusual presence of molybdenum (Fig. 7a), suggesting that the orange paint could in fact include molybdate orange (PR104), a solid solution of PbCrO4·PbMoO4·PbSO4 in varied proportions, combined with the dominant chrome yellow. This pigment mixture has been reported in contemporary coatings manuals to have been used to match the color of chrome orange at lower cost and better gloss . The presence of Mo in the orange paint is evident as a distinctive peak in Fig. 7a, whereas this is not seen in the underlying black paint (Fig. 7b) or in the yellow paint (Fig. 7c). The other XRF peaks in the vicinity of the Mo Kα peak are attributable to Pb Lγ lines, sum peaks of Pb and Cr, inelastic scattering of the Rh excitation source, and possibly trace Zr in the spectrum of the black paint. Molybdate orange has been a common industrial pigment since its commercialization in 1934–35 , but to date no published identifications of PR104 have appeared in the conservation literature. A seemingly related pigment identified as cadmium orange molybdate was, however, reported to be among the colors used by Willem de Kooning in his 1965 work Woman, albeit mixed with a variety of other pigments in two areas described as dark green and pink . This particular pigment is unknown to the present authors and is not listed in common pigment references. Among unpublished sources, molybdate orange was previously detected in the IMA’s 1967 Donald Judd sculpture Untitled (IMA#1992.362), and a poster presented at the 2015 American Institute for Conservation’s annual meeting in Miami reported its use in admixture with lead chromate yellow in Robert Murray’s Duet owned by California State University, Long Beach. As a mixed salt, molybdate orange generally contains only about 10 % lead molybdate . Because the tinting strength of molybdate orange is strong, the proportion of this colorant added to the paint also appears to be low, hence the weak intensity of the Mo peak when the pigment is admixed with another lead containing pigment. Additionally, this low concentration of molybdate orange obscures the distinctive Raman signature of this colorant (vide infra) when in the presence of the strongly scattering chrome yellow, therefore it was not observed in the Raman analysis for this passage of paint. Molybdate orange appears again in the red artist’s seals on all four prints. For example, the Raman spectrum of the red artist’s mark in Poem 70–90 (Fig. 6d) matches the spectrum of a molybdate orange reference pigment (Fig. 6e), and Mo appears again in the XRF analysis for all of the artist’s seals (Table 1). All of the Raman spectra taken from the seals also include a series of weak bands in the region of 1000–1600 cm−1. Molybdate orange is often blended with synthetic organic pigments to produce a red shade , particularly toluidine red (PR3) , but in this case, the spectral match with PR3 is poor. The Raman spectral bands for three of the red signatures, however, match those of the BONA pigment lake PR48:3, in which Poem 71–29 shows an additional small peak at 289 cm−1 that seems to suggest the weak presence of an iron oxide pigment. Unlike the other prints, the organic pigment in the red seal on Poem 70–70 matches the Naphthol AS pigment PR22, and calcium carbonate is also observed. This suggests the use of a similarly colored, but slightly modified paint formulation. An additional peak shoulder at 1598 cm−1 indicates the presence of what is likely another synthetic organic pigment. While this pigment could not be identified with confidence based on one shoulder peak, this spectral feature could be the strongest Raman band of PR48:3, the synthetic organic pigment found in the other red seals. The vibrancy of the contrasting colors in the Haku Maki prints and the potential for lengthy or repeated exhibition raised concerns over the stability of the inks to light. Chrome based pigments are known to darken upon exposure to light, and the lightfastness of aniline black is variously reported as either good or questionable. Herbst and Hunger’s authoritative industrial textbook describes the lightfastness of aniline black as good in the masstone, but weaker when admixed with titanium white . However, several artists’ websites and watercolor manuals list the pigment in commercial paints as being of only moderate lightfastness or fugitive unless mixed with carbon black [19, 20]. Molybdate orange in particular is considered to have only modest lightfastness [18–20]. One print, Poem 71–29, was chosen for in situ lightfastness testing as it has a wide ranging palette including the pigments of particular concern. Figure 8 shows the total color change (ΔE) of the various paints in comparison to BWS 2 and 3 upon exposure to visible light. Any change faster than the fading curve of BWS 3 is considered fugitive  and careful consideration is required when planning exhibition lighting and duration. Other than the orange and yellow paints, all colors tested performed better than BWS 3 and did not show dramatic lightfastness issues. In this print, the aniline black paint did not show rapid color change. Due to mixed reviews on its lightfastness, we studied the fading of the pure pigment prepared as a watercolor as well as in an equal mixture with a commercial lamp black watercolour medium (Fig. 9). The MFT results show that aniline black is in fact particularly susceptible to color change on its own, altering at a rate greater than BWS3. Analysis of the individual color coordinates indicates that the aniline black pigment shifted to become lighter and slightly more yellow. However, when mixed with a carbonaceous black pigment, the mixture demonstrates suitable lightfastness with a fading rate slower than BWS3. Analysis of the individual color coordinates showed that the aniline black and lamp black mixture shifted to become only very slightly lighter. These results reveal that mixing a carbon black with aniline black improves the lightfastness of the organic colorant, perhaps simply due to dilution of the more fugitive colorant and the screening effect of the more stable lamp black. This observation supports the conclusion that the black background in the Haku Maki print is also a combination of the two pigments based on the better than expected lightfastness of the black background. Multiple studies have demonstrated the darkening of chrome yellow pigments and have attributed this phenomenon to the reduction of Cr6+ to Cr3+ . The reaction is accelerated by sunlight and the action of sulfurous pollutants, leading to a color shift from yellow to brown. The color change observed in Fig. 8 for the chrome yellow paint used in the Haku Maki prints, changing slightly faster than BWS3, is therefore not surprising. The orange paint characterized as a mixture of chrome yellow and molybdate orange, however, altered even faster than pure chrome yellow, showing a rate of color change approximately halfway between BWS2 and 3. This result raises concerns regarding its exposure to exhibition lighting. Analysis of the individual color coordinates indicated that the orange paint shifted to become darker, less red, and less yellow. To explain this difference, we examined the sulfur content of the yellow and orange paints as revealed by Raman spectroscopy. Recent investigations have found that the darkening of chrome yellows also depends on the chemical composition (PbCr1−xSxO4) and crystalline structure (monoclinic or orthorhombic) of the material [22–24]. Sulfur-rich orthorhombic forms are more susceptible to browning. It has been postulated that PbCrO4 and PbCr1−xSxO4 are more soluble when in the orthorhombic phase, and thus more chromate ions are available for redox reactions . Table 2 shows the possible chrome yellow variants based on PbCr1−xSxO4. Using Raman spectroscopic analysis with 785 nm laser excitation, Monico et al. were able to discriminate between monoclinic and orthorhombic PbCrO4, as well as intermediate chrome yellow variants, where x = 0.1, 0.25, 0.5 and 0.75. When the sulfate concentration increases (as x increases), the ν1(CrO4 2−) mode at 841 cm−1 changes to 845 cm−1 and the ν1(SO4 2−) mode moves from 971 cm−1 (x ≈ 0.1) to 978 cm−1 (x ≈ 0.75). For the monoclinic structure, the ν2/ν4(CrO4 2−) modes are located at 400, 377, 358, 336, and 323 cm−1, whereas peaks at 411, 384, 362 and 341 cm−1 are characteristic of the orthorhombic phase . These spectral markers were compared to the Raman spectrum of the Haku Maki yellow paint, in which the bands at 840, 400, 377, 358, 337 and 325 cm−1, along with a weak sulfate band at 970 cm−1, all point to a predominantly monoclinic phase with low sulfur content of x ≤ 0.1. However, it is possible that mixtures of different phases exist in the paint. When the orthorhombic and sulfur-rich (x > 0.4) phase is mixed in substantial amounts with the monoclinic phase, the peaks appear at 841, 402, and 359 cm−1, resembling monoclinic features due to a higher Raman scattering coefficient for the monoclinic phase, and the sulfate peak occurs at 978 cm−1 . Noting that the yellow pigment used in Haku Maki’s print gives a weak sulfate peak at 970 cm−1, we can deduce that it is predominantly monoclinic with low sulfur content (x < 0.25). This may explain why the MFT results show only slight darkening of the yellow paint with accelerated light aging. Interestingly, the Raman features of the orange paint matched that of the yellow paint, attributing the primary pigment to chrome yellow in its predominantly monoclinic phase . Considering that both the orange and yellow paints were applied at the same time and aged together in the same environment over the same period, it is surprising that the orange paint darkens much faster than the yellow paint. Since the orange paint has an additional component of molybdate orange, it would be interesting in the future to consider the role that this pigment mixture plays in the rate of the color change reaction. Haku Maki is recognized as an innovator of Japanese woodblock printing techniques, and his prints are highly sought after. His use of bright colours, as well as his unusual embossing technique, creates works that blend traditional Asian subject matter with a fresh, visually appealing style. All of these artistic traits arise from a masterful manipulation of light, gloss, contrast, and color. However, in the works studied here, light scattering from a now dormant mold has compromised Maki’s aesthetic, and the removal of the fungi without impacting the underbound matte black paint remains a conservation challenge. An in-depth investigation of Maki’s pigment choices using non-invasive light-based technologies like Raman microspectroscopy facilitated by in situ XRF analysis has identified an extensive palette of luminous pigments. This unprecedented study of his material choices suggests the use of commercial paints that while similar in color, varied in composition over the years. Of particular note in these colorants are the occurrences of aniline black and molybdate orange, which have not been positively identified previously in fine art prints. The observance of these pigments has also led to a study of the lightfastness of Maki’s palette using visible light induced accelerated fade testing of an exemplar of his “Poem” series. This lightfastness study identified several inorganic pigments like chrome yellow and molybdate orange that are susceptible to loss of intensity and darkening upon exposure to light and demonstrated somewhat surprisingly the lightfastness of the somewhat fugitive aniline black when mixed with a carbonaceous black pigment. These studies highlight the importance of light in the appreciation of these vibrant modern woodblock prints, the utility of light-based analyses in understanding the artist’s material choices, the role of light in the degradation of these same artworks, and the importance of identifying artist’s materials for customizing stewardship practices. This project was initiated by paper conservator CH. LC and GDS conducted the scientific analyses while CH contextualized the results. All authors contributed to the manuscript. All authors read and approved the final manuscript. LC recognizes the IMA for the award of an IMA Scholar fellowship in 2015–16. IMA Curator of Asian Art John Teramoto provided helpful guidance. The authors would also like to thank Donald A. and Loryne M. Coffin for their generous donation of the Haku Maki prints to the IMA. The Infrared and Raman Users Group. http://www.irug.org. Accessed 3 Mar 2016. CAMEO: conservation and art materials encyclopedia online. http://www.cameo.mfa.org/wiki/Aniline_black. Handprint guide to watercolor paints. http://www.handprint.com/HP/WCL/waterw.html. The color of art pigment database: pigment black. http://www.artiscreation.com/black.html#PBk1. Accessed 3 Mar 2016.